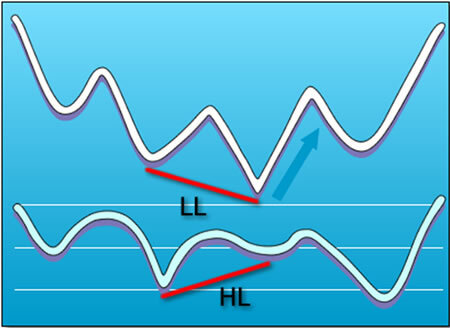 A regular divergence is used as a possible sign for a trend reversal. There are two types of regular divergences: bullish and bearish. 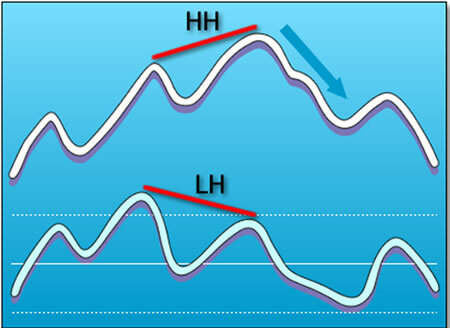 If price is making lower lows (LL), but the oscillator is making higher lows (HL), this is considered to be regular bullish divergence. This normally occurs at the end of a DOWNTREND. After establishing a second bottom, if the oscillator fails to make a new low, it is likely that the price will rise, as price and momentum are normally expected to move in line with each other. Below is an image that portrays regular bullish divergence. Now, if the price is making a higher high (HH), but the oscillator is lower high (LH), then you have regular bearish divergence. This type of divergence can be found in an UPTREND. After price makes that second high, if the oscillator makes a lower high, then you can probably expect price to reverse and drop. In the image below, we see that price reverses after making the second top. As you can see from the images above, the regular divergence is best used when trying to pick tops and bottoms. You are looking for an area where price will stop and reverse. The oscillators signal to us that momentum is starting to shift and even though price has made a higher high (or lower low), chances are that it won’t be sustained. Now that you’ve got a hold on regular divergence, it’s time to move and learn about the second type of divergence – hidden divergence. Don’t worry, it’s not super concealed like the Chamber of Secrets and it’s not that tough to spot. The reason it’s called “hidden” is because it’s hiding inside the current trend. We’ll explain more in the next section. Read on! What is a Range-Bound Market? What is a Currency Cross Pair? What Time Frame Should I Trade? What Time Frame Is Best for Trading?